Lock in a great price for Pousada Minha Louca Paixão – rated 8.9 by recent guests! The location is amazing (near the beach and restaurants) and no noises at night. The size of the room was okay for 2 people. The location is amazing! It's not right on the beach, but it's very close so it's easy to access the water. The breakfast was very good and the staff was wonderful. The property was also quiet and charming. Great location, beautiful decor, delicious free breakfast, friendly staff. Amazing infinity pool view of the beach/ocean. Facilities are good and clean. There are other activities as yoga, massage, gym, dance. Quiet environment. Everything is awesome. For us the location was perfect, not too far from city center but not too close either for you to hear the noise. We stayed in the Pinhão room, a Sea View Suite. The room is had plenty of space, a king size bed + single bed and you still had lots of free space to move around and accommodate your luggage. Spacious bathroom (kind of integrated to the room) and a great shower. There was a safe in the closet to store valuable items. TV was good (HD and ~40") with satellite channels. Mattress and linings of good quality. Good decoration, the interior design looks new and fresh. The location is awesome. The rooftop pool area and the view is hard to beat. The property is amazing. Right by the beach and easy distance from everything. The staff was very helpful. The massage was great. The infinity pool relaxing and the bar had great drinks. The hot tub could have been a tad bit hotter but that's honestly pulling hairs. When I'm ever back in Morro de São Pãolo, I'm definitely staying here again. They also spoke English which was great for me when I wasn't with my Brazilian friend. The food was great and the breakfast buffet is very rich with changing cakes, quiches and juices every morning. The location is right between praia 2 and 3 which was perfect for us. We took the Amendoim suite with a jacuzzi which was very spacious a comfortable. The swimming pool with a great view is the highlight. The hotel is really nice and the location is awesome. The restaurant is great. The gym is ok.
Best location. Breakfast is amazing. The pool is AWESOME! Pousada Minha Louca Paixão This rating is a reflection of how the property compares to the industry standard when it comes to price, facilities and services available. It's based on a self-evaluation by the property. Use this rating to help choose your stay! One of our top picks in Morro de São Paulo.Pousada Minha Louca Paixão is on Morro de São Paulo´s Third Beach, steps from natural pools and downtown. It is also close to the main nightlife attractions in the island. 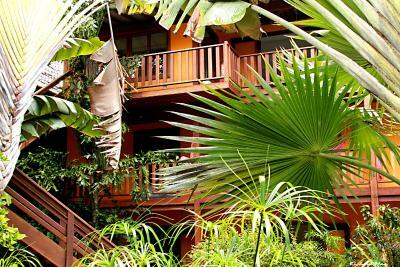 This guest house, painted in bright colors, offers cozy decorated rooms with wooden furnishings and private balconies. All rooms are air-conditioned and have a shower and a toilet. The room also offers a mini-bar and a flat-screen TV. Pousada Minha Louca Paixão has a lush garden with seating areas, 2 swimming pools in different settings, plus massage services. Free WiFi is available through the whole property. A variety of fresh local food, as well as international meals, is served at the restaurant on site. Alcoholic and nonalcoholic beverages can be enjoyed at the bar. 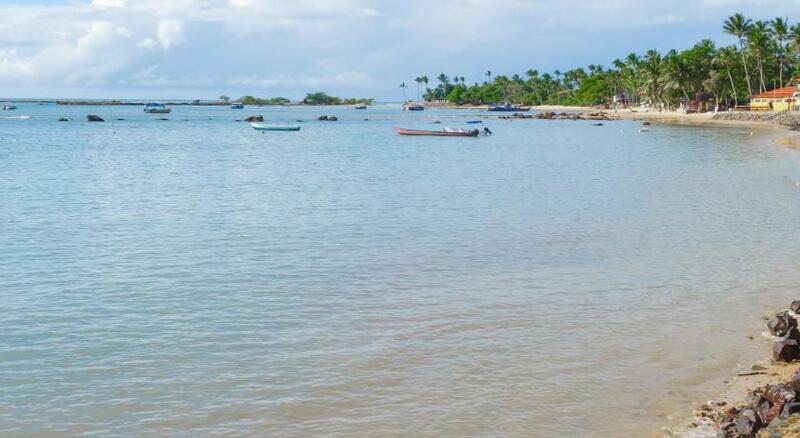 Saudade Island is 650 feet from Pousada Minha Louca Paixão, while Second Beach is 1,000 feet from the property. The nearest airport is Luis Eduardo Magalhães Airport, 50 mi from Pousada Minha Louca Paixão. 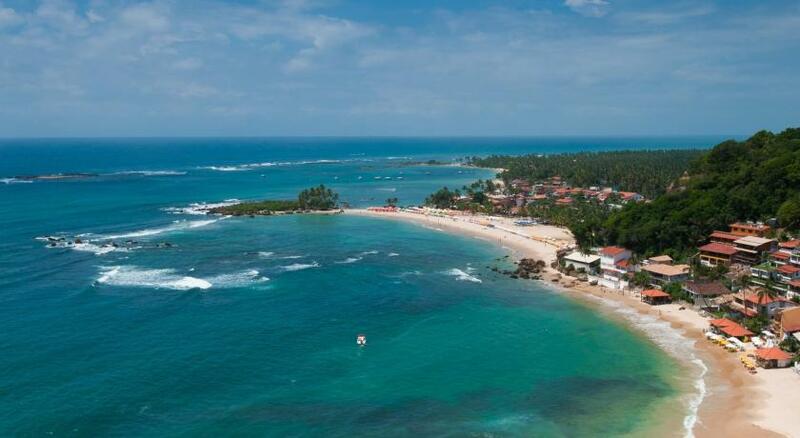 뀐 Located in the top-rated area in Morro de São Paulo, this property has an excellent location score of 9.4! When would you like to stay at Pousada Minha Louca Paixão? 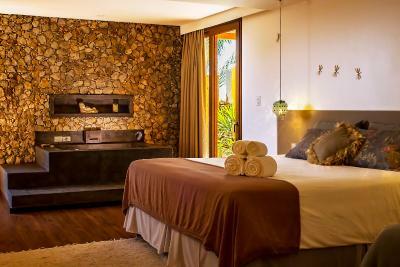 This air-conditioned room features a balcony, TV, mini-bar and private bathroom with a hot shower. 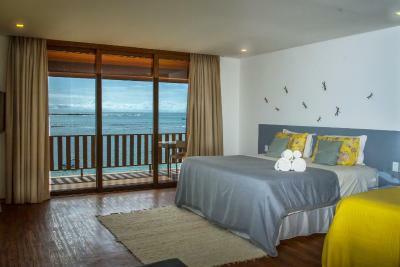 This air-conditioned room features a balcony with sea views, TV, mini-bar and private bathroom with a hot shower. This suite features a balcony, hot tub and mini-bar. Minha Louca Paixão ... Planted by the sea, where the sun rises and the moon comes ahead of dating on your balcony, Pousada Minha Louca Paixão is a place to call their own. Here, everything is designed for your well being. Are you in the right place. House Rules Pousada Minha Louca Paixão takes special requests – add in the next step! Pousada Minha Louca Paixão accepts these cards and reserves the right to temporarily hold an amount prior to arrival. Please note that the property will be going through renovation works. During this period, guests may experience some noise or light disturbances, and some hotel facilities and services may not be available. Please note that the remaining amount of the reservation must be paid upon check-out with credit card or cash.Third party credit cards, business credits cards or checks will not be accepted. Great location next to crowded second beach and this location silent on third beach. Friendly staff. Breakfast and restaurant are very good. The rooftop swimming pool is absolutely awesome. Enjoying drinks in the jacuzzi. Garden is lovely with more quiet swimming pool. Been many places in morro the last 14 years and this hotel will be on the top of my list for sure. The minibar was not working well and was making a continuous noise. The room was comfortable and the hotel has a chilled contemporary feel to it which was great but sadly Compared to The price I paid this is NOT value for money! Tge manager was excellent as was the reception staff however most other staff made you feel like an inconvenience whilst busy posting their instagram posts... hardly anyone apart from reception and manager spoke even a word of English. For the price I paid I would at least expect the staff to look half interested. I cannot recommend this place as other establishments we stayed in during our trip to Brazil all had consistently friendly staff. I will definitely be coming back!! I had such an amazing time here. The staff was very friendly and accommodating. Can’t wait to book my next trip! The infinity pool was one of the big draws for us, but we didn't get to fully enjoy it because smoking is allowed around and IN the pool. The constant cigarette smoke really put a damper on our enjoyment. Also, our room smelled very musty, which was unpleasant. For small kids, the rabbits and turtles on property are a great touch! WiFi doesn’t always work well in the hotel. There was no coconut water for sale. Wifi reception wasn't great during our stay. It resets every 30min so you had to log back in very often On the last day, noticed that the shower head was filthy and has clearly not been cleaned in a while. Wish I didn't look up! Service at the restaurant was very slow and the waiters that served us during our 4-day stay need a lesson in hospitality. They don't speak English which is fine because we came prepared with our Google Translate app. However, they were unwilling to help even though we made an effort to ask a couple of questions in broken Portuguese. They were snarky and made us feel very uncomfortable. This is a great shame given the standing of the hotel and the efforts made by the rest of the personnel to deliver the best possible experience to the guests. Coffee in the suite is not free. Pool time is too short.